Here is a gift that you can use at the Thanksgiving table. These Table Talk Cards are designed to bring your family closer this Thanksgiving as you share with each other special memories, inspirations and the providences of God in your life. 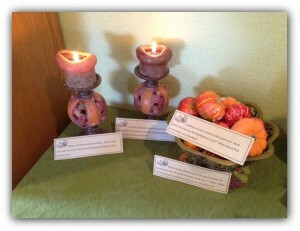 Each card is imprinted with a question to encourage conversation focused on gratitude. This set comes with eight cards but you can make multiple copies if you are expecting more guests at your table. Please click below to receive a free download containing the instructions for a great Christmas tradition for your family – Advent Prophecy Boxes. 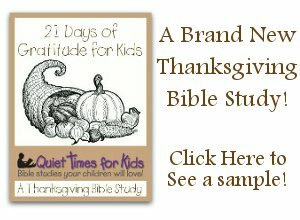 This family devotional activity can be a fun way to teach your children of the miraculously fulfilled prophecies in the life of Jesus Christ. Click Here to watch a video describing the Advent Prophecy Boxes. Please accept this gift from our family to yours! Recently I have spoken at a few homeschool conferences and seminars in the Denver area. Many have requested the power point presentation and notes from those talks so I thought I would post them here for anyone who would be interested! I pray they encourage you in the high calling of managing your home and disciplining the next generation! Recently I spoke at the Family Economics Conference in Colorado and created 5 documents to help children plan and begin their own business. I thought many of my readers would benefit from these resources as well. You will find a basic worksheet to fill out with your child to help determine what type of business would be best for them. You will also find basic accounting registers that will help you keep track of finances and expenditures. I hope these are helpful and feel free to email me if you have any questions! This week I spoke at the Colorado Homeschool Conference on Anger in the Home and Creating a Lifestyle of Discipleship. I don’t know about you, but often in the heat of a difficult moment with one of my children, I have a hard time finding ‘faithful instruction’ on the tip of my tongue! So that is why I am constantly developing resources and signs to help me remember to bring God’s Word to bear on every situation in our home. I hope and pray that these PDF files will be helpful to you as you nurture and disciple your little ones by bringing them to God’s Word daily! In our home, discussions on child training seem to be a daily occurrence. Scott and I have spent literally hundreds of hours trying to figure out how to best ‘train a child in the way he should go’. We have read countless books and watched many videos, and we are still in the process of learning. My husband has said many times that the best child training is a great marriage and I am beginning to believe him. This free download is a seven page guide to help you and your spouse get on the same page in child training. On the first page you will find a chart that we made for ourselves years ago with the goals we have set for our children based on their ages. The weeds image on this page was a word picture to ourselves to remind us that if we do not deal with seeds of rebellion in our children’s hearts early on, they will become deeply rooted undesirable weeds later on. The second page is a four step training process we learned from a friend and how we see it working in our family. The third page is a goal setting sheet we use with our children to help determine specific behaviors for which each child needs discipleship. The remaining pages are for you and your spouse to work on together to set your own training goals and determine what steps you will take to get there in your family. Of course, each couple’s goals will vary from family to family so please, just use the first few sheets as an idea guide. We pray this resource is helpful to you and your spouse in your very important ministry of training up your children! As a busy parent, finding time to pray for each of your children can be a real challenge. Yet we all know how important it is to bring our sweet little ones before the throne of grace in prayer. I created these prayer cards to help me have a more directed and focused prayer time for our seven children and I thought I would share them with you. As you open the PDF file you will notice that there are six cards on the first three pages. Each card has three specific character traits and corresponding verses to pray for your child for each day of the week. The traits to pray for vary in order for each of the six cards and you will find the cards numbered on the bottom right corner. Print out a card for as many children as you have (you may have to print duplicates if you have more than six kiddos) and write each child’s name in the box at the top. The final page has lines for specific prayer needs for that child and is meant to be printed on the back of each prayer card so that it can be personalized. I recommend printing them out on card stock paper and placing them in your Bible or on your nightstand – wherever you will see them often and be reminded to pray. I plan to use them when I am nursing our youngest. I pray these prayer cards are a blessing to you! Busy Mama’s need to take advantage of every opportunity to fill children with truth from God’s Word! 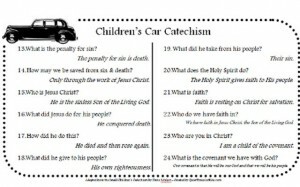 That is why I created this Children’s Car Catechism. Simply print out both pages, put them back to back and laminate, and put it under the visor of your car. 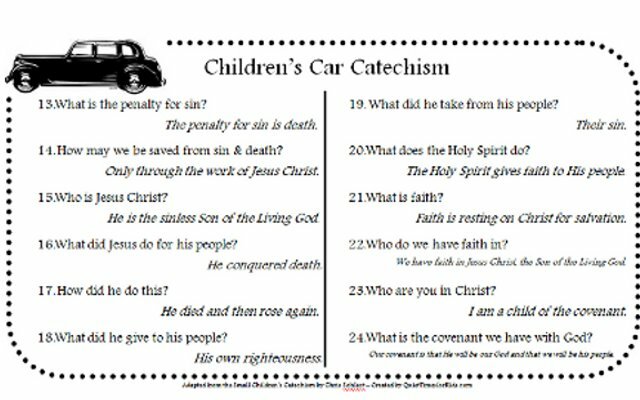 As you are driving or waiting in the car, use that time to help your children memorize the answers as you deepen your faith! Connecting with your child’s heart is something every mom desires to do. However, with the fast paced life we all seem to live it makes it hard to meet each of our children’s needs and disciple them the way we know we should. Here is a simple tip to help strengthen your relationship with your children. Buy a journal for each child who can write. Print out this ‘Mommy and Me Journal Topic Ideas’ page. Each time you write a letter to your child in their journal include these four things: a written out scripture, a personal experience from your life, an exhortation to obey the scripture and a question they can answer you in return. Check out our Video Blog to see how this works in our home! In our home learning to love one another and to be a peace-maker is a daily battle. I made these simple yield signs to place in various locations in our home to remind us to be willing to yield to one another by giving the other person preference over ourselves. Often when I overhear two children quarreling I will ask them to stop and go wait for me by the Yield sign (which is on the window near the kitchen). I give them a few minutes in silence to think over what happened and then I come and discuss it with them, exhorting them to yield to one another. In this PDF file you will find three signs. I recommend you print them out, laminate them and find three places in your home to place hang them up. Sit down with your children and read over the verse and teach them what it means. This can be a great tool to teach your children to love and honor each other. This simple sign is based on Proverbs 15:18 which teaches us that a patient person knows how to calm a quarrel. Any home with children in it (or adults for that matter) will struggle with quarreling. Sometimes all our children need are a few peace-making tools to help them learn how to calm a quarrel. I recommend printing out these signs and placing them in strategic places in your home. Create some incentive for your children when they use one of these methods to calm a quarrel with a sibling or friend. When they are in an argument, patiently lead them to the sign and give them some ideas of how they could have calmed the quarrel. As a mom with seven young children, I am constantly trying to find time to invest in them individually and meet each of their needs. I also am continually reminding myself that my children need much more positive interactions with me than negative corrections. For this reason I created a Blessing Jar for my children. Whenever I see them making an exceptionally good choice, persevering in their school work or really making an effort to serve others, I will reward them with a coupon from the Blessing Jar. Each coupon is a relational reward that helps keep me accountable to spend special one on one time with my children. Simply print out the coupons, find and decorate a fun jar to put them in and enjoy your children!